This royal robe is made of heavy duty velvet with faux fur trim. This robe is perfect for any royal king or queen costume and due to its quality is perfect for the demands of theatrical or performance use. It also works well as a cape for Homecoming or Prom Kings and queens for schools. 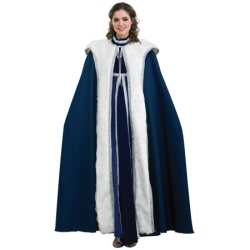 The Regal Cape adult costume is available in red with gold trim or blue with silver trim and measures 65” in length.